Apple will offer refunds to people who bought its latest iPad following a claim by Australia's competition regulator that it ran misleading advertisements over the device's 4G connectivity. The Australian Competition and Consumer Commission (ACCC) took Apple to the Federal Court in Melbourne on Wednesday for allegedly violating sections of the Australian Consumer Law. 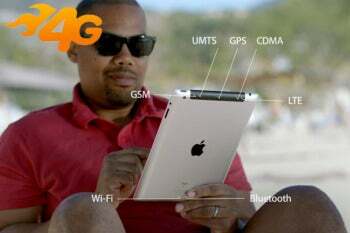 The ACCC claims that Apple's advertisements mislead the public over the device's 4G capabilities, as the latest iPad is not compatible with Australia's sole 4G network, which is run by Telstra. Telstra operates its 4G service within the 1800MHz band, while the latest iPad can only be used on the 700MHz and 2100MHz LTE bands. The new iPad is compatible with 4G LTE networks in the U.S. and Canada using data speed specifications including HSPA, HSPA+ and DC-HSDPA. At Wednesday's hearing, Apple agreed to several of the ACCC's remedies, although the two sides are scheduled for two more court hearings next month and a liability hearing in May. Apple agreed to display an advisory by April 5 on its website and in promotional material reading "This product supports very fast cellular networks. It is not compatible with current Australian 4G LTE networks and WiMAX Networks." The same message will be displayed in its stores and by resellers. The company will also e-mail people who bought an iPad between March 16 and March 28 and inform them of the connectivity issue and offer a refund, according to a news release published by the ACCC after the hearing. Apple officials could not be reached on Wednesday. An ACCC official declined to comment, citing the ongoing legal case. A directions hearing is scheduled for April 16, with a mediation hearing scheduled for April 18. A hearing on liability is scheduled for May 2. The ACCC said on Tuesday it would seek to ensure consumers are aware of the iPad's "correct technical capabilities" as well as pursue other orders including injunctions, financial penalties, corrective advertising and refunds.